My first standalone thriller, Blood Always Tells, just came out in paperback. (It’s actually my fourth novel, but it’s the first one that isn’t part of the mystery series I also write.) When Macmillan’s Tor/Forge division first published it last year, I went on a whirlwind tour across North America, which gave me the opportunity to suss out some celiac-safe places to eat… though no time to write about them! But I kept notes and want to share a few favorites that stand out in my memory. 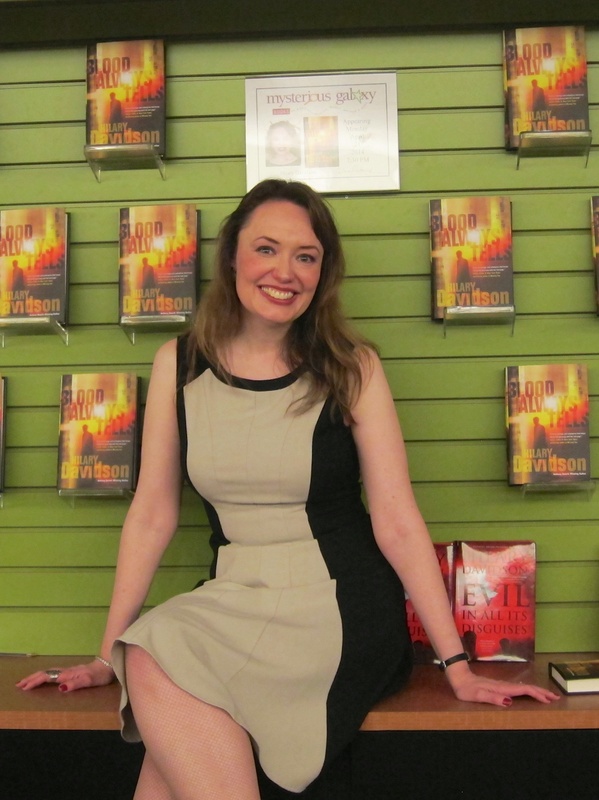 The truth is, I ended up at Bistro 241 because it was a few doors down from Murder on the Beach, a terrific independent bookstore, and there was a terrible storm raging the night of my event. I was literally looking for the first indoor spot that was open for dinner, and I lucked into this one. There’s no gluten-free menu, but the restaurant’s owner is familiar with the GF diet and willing to make modifications wherever necessary (substituting a variety of veggies for the pita bread in the Mediterranean Plate, for example). A number of dishes, including the delicious chicken paillard, require no modification at all. I have plenty of reasons to recommend the Old Town Tortilla Factory. Great Mexican food? Check. Dedicated gluten-free menu? Check. Neon-bright margaritas? Check. A short walk away from the fabulous Poisoned Pen Bookstore? Check. What more could you want? On my first first to the fabulous Hotel Valley Ho in 2010, Cafe Zuzu didn’t have a gluten-free menu, though it did have well-trained, thoughtful staff who were able to make recommendations and accommodations (which I wrote about previously). While the staff is still terrific, I’m pleased to say that the restaurant now has a dedicated GF menu, complete with roasted cornish hen, grilled lamb, and blackened shrimp. Best of all, my beloved tomato burrata is now served with rice bread. Yes, it’s a chain (with outposts in California and Arizona as well), but its proximity to BookPeople and solid Southwestern food (and margaritas) make it a must-visit in Austin. Z’Tejas‘s dedicated gluten-free menu isn’t large, but it includes several vegetarian options (not always easy to find in these parts). This local Italian chain always stocks rice pasta and gluten-free Quejos pizza crust at all of its locations. Il Fornello also offers great salads (the naturally gluten-free Roma salad is a solid bet, with its mix of greens, goat cheese, walnuts, and roasted peppers), and a reasonably priced list of wines by the glass, including several from Ontario wineries. This entry was posted in Restaurants and tagged Arizona, Austin, Canada, Colorado, Denver, Florida, Ontario, Phoenix/Scottsdale, Texas, Toronto, USA by Hilary. Bookmark the permalink. This is really which i looking. Bistro 241 in Delray Beach, Florida and Cafe Zuzu at the Hotel Valley Ho in Scottsdale, Arizona are very amazing palace.. Rest of place i will experience soon.